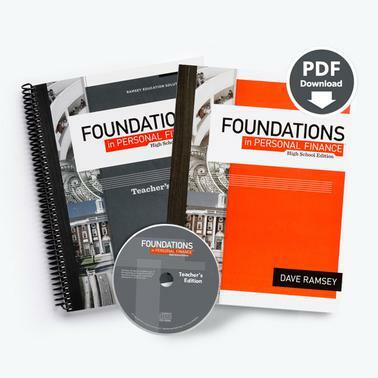 Foundations in Personal Finance—High School Edition is a complete, turnkey curriculum designed to fully equip you with everything you need for a dynamic classroom experience. We've included lesson plans, teaching delivered via video by Dave Ramsey and his team of experts, blended learning, and a TestGen® computerized test bank. In addition, more than 100 activities are included which focus on providing 21st century personal finance knowledge and skills in a student-centered, competency-based approach to learning. This resource includes a 272-page print teacher’s guide and a 600-page teacher's guide that is available on CD-ROM or as a digital download. The guide includes more than 100 activities, pre- and post-tests plus summative assessments for each chapter, case studies and radio calls. Digital streaming provides more than 12 hours of engaging classroom instruction taught by Dave Ramsey, Rachel Cruze and Chris Hogan. Our Foundations in Personal Finance—High School Edition curriculum comes with access to our blended learning site. FoundationsU.com is full of interactive tools, teen articles, and real-world activities on a student-focused website designed for all devices. The Foundations in Personal Finance—High School Edition Student Text is a comprehensive, 288-page student text in PDF format. The site license allows for unlimited printing of the student text. License agreement.